Known as the Cradle of Liberty, Boston is home to historic buildings, monuments and attractions. When visiting the city, consider these top family-friendly destinations. The Freedom Trail is a 2.5-mile trip back in time. The American Revolution will come alive as costumed interpreters guide you along the path. You will visit a unique collection of museums, churches and historically significant sites. Along the way, you will hear stories that illustrate Boston’s pivotal role in America’s fight for freedom. Faneuil Hall is also known as Quincy Market. This popular venue has served as a meeting hall and marketplace since 1742. The collection of four historic buildings houses an eclectic mix of interesting shops and wonderful eateries. Clowns, musicians and other street performers entertain visitors in the hall’s open-air courtyard. The Boston Tea Party Ships and Museum enables visitors to reenact one of the pivotal events in American history. The museum displays one of the actual casks of tea that the protesters tossed into the harbor. The fully narrated and interactive tour combines technology and live performances. You can also explore the museum’s three historic tall ships. 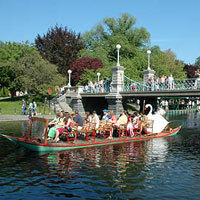 Join the Old Town Trolley and see the best of Boston. From Beacon Hill to the New England Aquarium, the Back Bay to Boston Common, Old Town Trolley is the best way to experience Boston. Hop on and Hop off at any of the 20 designated stops. The Museum of Science has a variety of interactive exhibits that will amaze the entire family. There are live animal performances as well as laser and planetarium shows. The electricity demonstration features a 15-foot lightning bolt. The museum inspires imaginations while empowering guests to explore their relationship with science and technology. The Boston Children’s Museum is considered one of the best of its kind in the world. It contains three floors of interactive exhibits. The galleries also include the Japanese House, daily arts and crafts activities and theater performances starring the young visitors. Children can dress up and take center stage with other aspiring performers. The Skywalk Observatory located atop the Prudential Building provides a bird’s-eye view of the city. Feel your ears pop as the high-speed elevator takes you 50 stories into the air. There is a self-guided audio tour. You can also view exhibits dedicated to the various groups that have immigrated to Boston. The USS Constitution, is the world’s oldest commissioned warship. George Washington named the vessel in 1797. She earned her moniker, Old Ironsides, when cannon balls bounced off her wooden hull during the War of 1812. Climb aboard and experience the life of an early 19th century seaman. Christopher Columbus Waterfront Park is a popular neighborhood recreation area. The park has marvelous views of the harbor, and the wisteria-covered walkways are perfect for picnics. Amenities include complimentary Wi-Fi, an elaborate play structure, spray fountains and a large sandbox. The New England Aquarium has a four-story, 200,000-gallon ocean tank that contains sharks and other aquatic animals. The tank is surrounded by three levels of interactive and informative displays. The Aquarium Plaza is home to the popular outdoor seal exhibit. Young visitors will enjoy the touch pools and the Curious George Discovery Center.